"Mandatory" and "Sentencing" are two words that do not belong in the same sentence. They have been thrust together in the last few days by the Coalition's announcement that the Government intends to table legislation next week making a life sentence mandatory for persons convicted of killing a police officer. Mandatory Sentencing has, to say the least, a chequered history in Australia. After the scandal that eventuated in the Northern Territory when a "three strikes and you're in" policy was tried, most governments have been loathe to try again. There are already a few areas where New South Wales has mandatory sentencing, although it might be more accurately described as being "mandatory sentencing lite". There are a multitude of driving-related offences where a magistrate must, upon, conviction, disqualify the driver for a minimum term. Further, if a person breaches an Apprehended Violence Order "with an act of violence" then the person should be sentenced to a term of imprisonment "unless the court otherwise orders". - Where as person is "convicted of murder if the court is satisfied that the level of culpability in the commission of the offence is so extreme that the community interest in retribution, punishment, community protection and deterrence can only be met through the imposition of that sentence"
- in particularly serious drug supply matters, where the court considers it appropriate. These "mandatory sentences" still allow the court to consider the objective seriousness of the offence in deciding whether the imposition of a life sentence is appropriate. Between 2003 and 2008, it appears that at least 7 people have been sentenced to life imprisonment for murder in New South Wales. So - does New South Wales need mandatory sentencing for police killers? I would suggest no. "A court is to impose a sentence of imprisonment for life on a person who is convicted of murder of a police officer acting in the execution of his or her duty unless the court is satisfied that the circumstances of the case do not justify it." That would, in effect, mean that the court will start with a life sentence and decide whether it appropriate to give anything less. It would also leave some discretion for the judges to decide whether a life sentence is appropriate or not, rather than mandating a blanket rule. That said, the law already hands down more serious penalties for murders where the police officer is the victim.. Section 21A of the Crimes (Sentencing Procedure) Act 1999 mandates that any offence is aggravated (and the penalty therefore increased) where the victim was a police officer. Further, the Standard Non-Parole Period (the sentence the court must impose for a "mid-range" offence) is 25 years where the victim is a police officer. The crime of murder carries a life sentence as a maximum penalty. There is no minimum sentence, and no requirement that a person even be imprisoned, but unsurprisingly the stats reveal that the penalties are very heavy. For the 112 offences recorded in the Judicial Commission's statistics between 2003 and 2009, the shortest sentence imposed was one of 12 years. Most received at least 18 years, with 37 persons (or 33%) receiving more than 25 years. The statistics I have access to do not provide a breakdown of the sentences for police offices. However, the case of Penisini is a useful example. 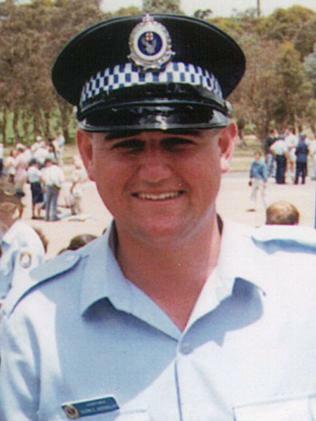 Without getting lost in the detail, Penisini was sentenced for the brutal murder of Constable Glenn McEnallay. The Constable briefly pursued Penisini's car after he was informed that it was stolen. After the stolen car collided with a gutter, Penisini got out the car and fired 5 shots through the drivers side window of McEnalley's car. The officer died 7 days later. While assessing that the matter fell towards the upper end of seriousness for a murder (not least of all because the victim was a police officer), the court took into account a number of mitigating factors (including the plea of guilty, remorse and youth) and sentenced him to 34 years imprisonment, with a non-parole period of 23 years. If you're interested, the sentencing judge in Penisini lists and gives a brief description of the previous matters where the court decided that a life sentence was appropriate. That part of his judgment is extracted in the Court of Criminal Appeal decision and can be found here (see paragraph 13). As the Court of Criminal Appeal said when it declined to increase the penalty to life imprisonment (as was sought by the Crown), "The sentence... imposed was a heavy sentence, even for the crime of murder." I do not propose to enter a detailed analysis of the decision in Penisini, nor do I suggest that that penalty was correct or otherwise. What I do say is that it is a good example of the way in which the court is able to consider both the aggravating and mitigating factors in a murder where the victim was a police officer. If the penalty was a mandatory life sentence, there is by definition no discretion whatsoever. Every case is different, and while it is wholly appropriate that heavy sentences be imposed for persons who kill police officers, this move would remove all room for discretion and increase penalties where there is no evidence that the court's decisions are unduly lenient. There a multitude of other reasons why mandatory sentencing could create negative results. No doubt pleas of not guilty will become more common, given there is to be no allowance for a plea of not guilty. All of the above offences were heinous in the extreme, and wholly deserving of a life sentence. It is difficult to understand what it is that makes the killing of a police officer so much worse that it should be the offence singled out for a mandatory life sentence. Worst of all, the fact that this suggestion comes out of the blue forces one to wonder whether the change is being made purely for political purposes - to muddy the water as the Coalition brawls with the police union over their pay increases. Either way, in the absence of examples where the government suggests that the sentences are unduly light, there would appear to be no need for a change. And certainly not a move towards mandatory sentencing.